Albertos Antiques is an antique shop in London offering old antique fireplaces in the Victorian and Georgian style. As well as register grates and inserts, mirrors, doors, radiators and many more quality antiques and collectibles. A large antique arched chimneypiece in very rare Belgium Black marble, late Regency George IV. English circa 1820. An Antique Louis XVI Fireplace in Rouge Griotte marble and Belgium Black marble, with simple linear decoration of flutes and raised and fielded panels. French 19th century. A mid-19th Century matched pair of antique Lion Statues, Hand Crafted in Stone. A mid-19th Century English antique ornate mid Victorian cast iron arched fireplace insert with unusual louvre back and keyhole shaped aperture. 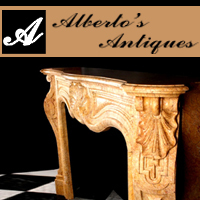 Add style and uniqueness to your home, office, or garden with Albertos antiques masterpieces sourced from every corner of the world. Arch 205, Grove Green Road, London, E11 4AJ. Please visit our showroom or contact us on 0208 9889 183 for more details.